Hey guys! 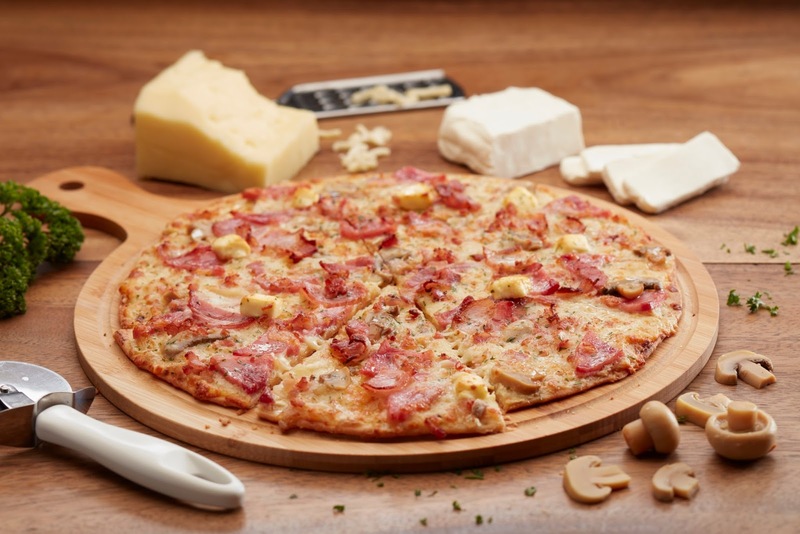 Our Greenwich Barkada has great news for all you pizza lovers! Greenwich has just launched their latest pizza called Bacon Pizza Thins. It's a limited edition pizza that has a generous portion of bacon, cream cheese, mozzarella, ham and mushroom on top of a crispy thin crust. Chef Ed Bugia prepared a special menu for us consisting of appetizers, the main course and a dessert with non other than the key ingredient of the Greenwich's newest pizza, bacon! I found these a bit sweet for my taste. I somehow cannot link sweetness to French fries. I think it was the apple that was in the fries that contributed to the sweetness. Personally, I prefer my fries either cheesy, spicy or a little salty. Now this was really good. I am very picky when it comes to soup, but this had the right balance of creaminess and saltiness. It was so good that I finished the bowl and I could have gotten a second serving if not for the food that we are still about to take. In my opinion, this would be nice to be included in the Greenwich menu. I'd definitely order it! after all, we were just starting! Haha! Time to cleanse our palate! It's not alcohol, but a shot glass of a citrus-herb concoction. The star of the launch, The New Greenwich Bacon Crispy Thins Pizza! It's creamy, cheesy and full of bacon. It's packed with ingredients (bacon, cream cheese, mozzarella, ham and mushroom) ergo very filling and great to share with friends. This is my favorite go-to pasta from Greenwich. Even Garfield would agree! These are really tasty and juicy that I actually went back again to Greenwich a few days after the launch and ordered this. It is consistently good. Alright guys, bring your barkada and head on to your nearest Greenwich Pizza branch (or call Greenwich delivery at 5-55-55 to get all that bacon goodness delivered straight to your door), because the new Greenwich Bacon Crispy Thins Pizza will not be around forever, it is available only for a limited time until September 30, 2016. Also, watch out for exciting activities from Greenwich on National Bacon Lover's Day on August 20, 2016.